The latest weather forecast for East Yorkshire. 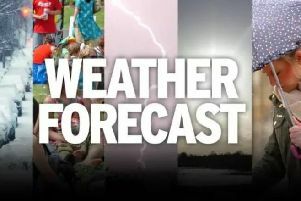 Your week ahead forecast for East Yorkshire. Tuesday: Continuing dry, bright and breezy for much of the day. A chance of more persistent rain later. Wednesday: Fresher with near normal temperature. Dry with sunny spells. Thursday: A very unsettled day with spells of rain and strong winds. Gust 60 mph+ possible. Keep updated with forecasts if this could pose a problem. Friday: The calm after the storm. Cooler, fresher, light winds and sunshine. More wet and windy weather late in the day. W/E: Unsettled with strong winds and bands of rain from time to time. O/L: Mild with below average rainfall.